Above the commercial space the domestic appearance of the vintage house survives. Union Square was nearing completion in 1841. A large fountain formed the centerpiece of the oval park girded, which was girded by a handsome cast iron fence. Around the park upscale brick and brownstone homes were rising. That year Dr. Benjamin B. and Nancy S. Edwards completed construction of their new home just steps to the north on Broadway. The brick-faced house was an ample 25-feet wide and three stories tall. Within two years of moving into the new home, Dr. Edwards died. Remarkably, it was not a male lawyer, but Nancy herself, who oversaw the administration of his estate in December 1843. The wealthy widow continued to live on in No. 859 Broadway. It would be decades before commerce caught up to the Union Square neighborhood, and Nancy's house sat among some of the finest residences in Manhattan. The parlor levels of many Italianate-style homes were graced with cast iron balconies. It was a detail overlooked in No. 859; but Nancy corrected that in 1846 when she petitioned the Board of Aldermen "to be allowed to erect a balcony in front of her house." In 1856 Nancy S. Edwards moved to No. 68 West 29th Street. She leased No. 859, furnished, to William Mitchell and his wife. Mitchell was the manager of the Olympic Theatre. Within only a matter of weeks after moving in, on May 12, 1856, the 57-year-old died. His funeral was held in the house the following afternoon. Nancy Edwards apparently let Mitchell's widow out of the lease. She placed an advertisement in The New York Herald on May 31 offering the furnished house for sale or lease, noting it was "delightfully located, looking into the park; bath room, gas, &c."
Artificial Bone Filling for Decayed teeth--Inserted while soft, and giving no pain. Aching teeth or mere shells can be filled and preserved, by the discoverer, J. Pearson, M. D., rooms 859 Broadway, west side, one door above Seventeenth street. N. B.--Beware of trashy imitations of cheap operators. In the first years following the end of the Civil War the tide of commerce arrived at Union Square and Broadway. One-by-one the high-end residences were converted for accommodate shops or razed to make room for commercial buildings. In 1869 No. 859 received a new storefront and, possibly at this time, an updated cornice. The businesses that invaded the neighborhood were upscale--dressmakers, jewelers, piano makers and such--which catered to the carriage trade. No. 859 was now home to Stevens & Co. jewelers. On December 20, 1872 The New York Times commented on the firm's holiday items. Stevens & Co., No. 859 Broadway, are offering a choice selection of diamonds, pearls, rubies, sapphires, and stone cameos, mounted in unique designs. These goods have been prepared expressly for the holiday season, and some excellent articles, suitable for presents, may be selected from them. One of the firm's executives lost his black Russian leather pocketbook on February 4, 1874. His panicked ad described it as having "gilt bindings, containing a sum of money." He dropped it either on 14th Street or between 14th Street and Broadway, no doubt coming or going from the shop. The reward, more than $1,000 today, suggests the value of it and its contents. The jewelry store was taken over by G. & F. Hartje jewelers around 1876. Like Tiffany & Co. on the lower fringe of the park, it designed and manufactured its pricey baubles. Among the skilled employees of G. & F. Hartje in 1882 was 29-year old William N. Evans. The social position of the young man's family was reflected in his membership in the Seventh Regiment--nicknamed the "Blue Stocking Regiment" for decades because of the wealthy men who made up its ranks. He lived on West 24th Street, just steps off Fifth Avenue. Evans left the shop on Friday July 14 and went to his home, where committed suicide. The New York Times reported he died "while suffering from mental depression, by shooting himself through the head with a revolver." As was often the case in affluent families, who avoided the taint of suicide, the police were not notified. Instead the coroner was summoned to the house "privately." In 1879 Edward A. Newell was leasing the building and had moved his haberdashery into the ground level. Founded in 1863, E. A. Newell dealt in "shirts, underwear, neck-wear, half-hose, handkerchiefs, jewelry, and men's furnishing goods." 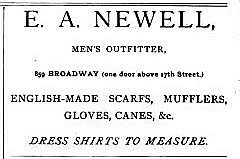 Customers of E. A. Newell would also find accessories here, like gloves, umbrellas and canes. Newell increased the commercial space in 1884 by hiring architect Charles E. Hadden to raise the rear section two stories. That year New York's Great Industries said E. A. Newell "here occupies one of the most elegantly fitted and commodious stores on Broadway, and which contains a stock of the finest imported and domestic goods." The publication referred to his patrons as "the best people, not only in this city, but all over the United States and even in Europe." The renovated shop upstairs, where G. & F. Hartje had been, was leased to portrait artist Marc Gambier who created his works either in paint, in crayon, or by photography. New York's Great Industries wrote "Imbued with indomitable energy, and the highest order of talent, Mr. Gambier has been recognized as the leader in his profession, and as an artist, photographer and portrait painter of wide celebrity." The article noted "On May 1, 1884, he removed to his present central and commodious premises in Broadway, which are elegantly fitted up, and contain on exhibition many striking masterpieces of Mr. Gambier's art." Like his landlord, Gambier catered only to the carriage trade, giving "close personal attention to the taking of strictly high class portraits." New York's Great Industries added "many of his magnificent works are to be seen in the homes of our best people." He devised a clever innovation, called "stamp photos." He provided clients postage stamp-sized copies of their photos, which could then be affixed to the stationery or envelope, personalizing the correspondence. 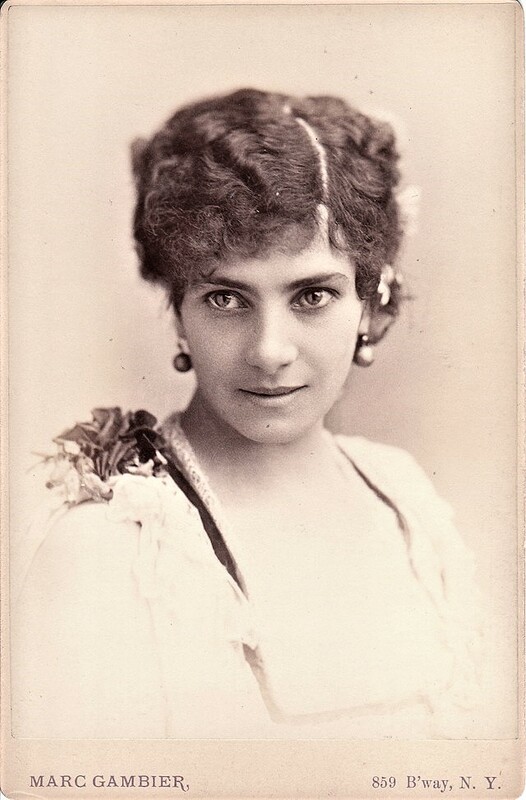 Two of Gambier's well-known sitters at the Broadway studio were Dr. George E. Belcher and actress Jennie Lee. 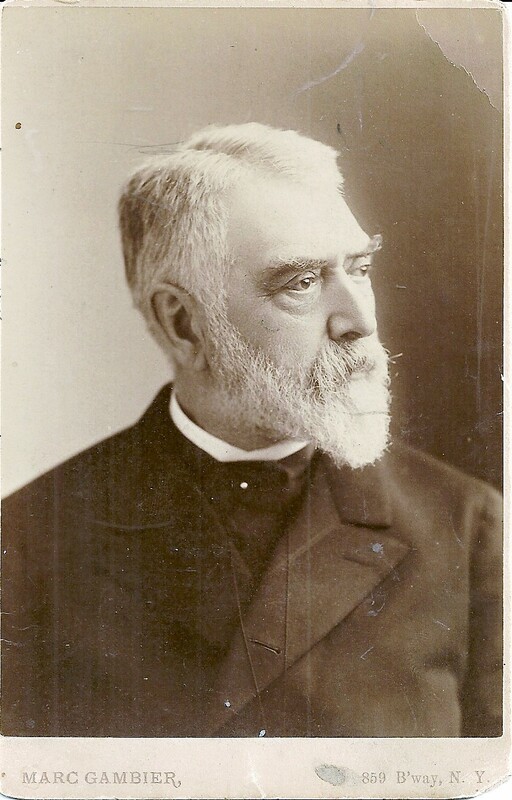 Edward A. Newell was a vehement opponent of Tammany Hall and a supporter of 1884 mayoral candidate William Russell Grace who was running on the reform ticket. Grace had been nominated by The Citizens' Committee, which The New York Times said on October 23 has already entered upon a most active campaign for his behalf. Newell strengthened his support by donating the upper floor of his building for the organization's use. "Headquarters, lighted, warmed, and furnished, have been given the committee at No. 859 Broadway by a prominent business man interested in the cause of honest municipal Government," advised the newspaper. The upstairs rooms were next used as the headquarters for candidate Hugh John Grant, who followed Grace as mayor. The Edwards estate still owned the property in 1886 when updates were made to the building, amounting to about $27,000 today. Newell was nearly duped in February 1888. A young man, calling himself Harry Beecher, captain of the Yale football team and grandson of Henry Ward Beecher, entered the store, saying he had already received estimates from several firms to "rig out the team in silk quarter sleeve undershirts and stockings." He asked the same of Newell. Samples were produced and Newell set the price for 11 sets at $400. The amount sounded good to Beecher, but he paused, saying his teammates might not be as pleased. The Sun reported "He ordered two sets sent to the Windsor Hotel to be inspected. The two sets were done up, but he appeared so anxious to carry the bundles himself that Mr. Newell half suspected that something was wrong." Instead, Newell sent the packages by his delivery wagon, including instructions for the hotel clerk. Under the watchful eye of the clerk, Beecher could not manage to get the packages out of the hotel. On Tuesday they were returned to E. A. Newell & Co. along with a card saying that "no such person as Harry Beecher was at the hotel." The Sun noted "The spurious Beecher has tried the same game unsuccessfully at McCreery's. The police are looking for him. He has curly hair and a flat nose." Eight years earlier, on January 9, 1880, Edward Newell had discovered that a clerk, Charles Francis Gilman, had systematically stolen $2,300 in cash from the store. It was a significant amount, equal to nearly $57,000 today. Confronted with the evidence, Gilman confessed and Newell, not wishing to ruin the man's reputation by prosecuting him, kept him on with the promise of repayment. Gilman withdrew $1,100 from his bank, his entire savings, and gave it to his employer, along with his watch, chain, and cuff buttons. He then signed a promissory note for the outstanding $1,200. The New York Times reported "After these formalities had been concluded employer and clerk went into a back room and prayed together." It seemed Gilman was back on the right path. In February 1881 he paid $490 towards the balance. But in 1885 he was caught stealing once again. This time Newell prosecuted. Gilman lost his job despite the jury's acquitting him. Now, in November 1889 Newell took him back to court, for payment of the original outstanding debt. But in a surprising twist it was Edward Newell who found himself in the greater trouble. According to The Times on November 27 Gilman told the court "that he ever stole anything from Newell, but says that the money and note were forced from him under threats of a criminal prosecution, and that he gave them because his mother had shortly before had an apoplectic attack, and he was afraid that the shock of his prosecution would kill her." He then accused Newell of making him do jury duty for him, identifying himself as his employer to the courts. To strengthen the claim, W. W. Underhill, president of the United States Fire Insurance Company, testified that he had service with Gilman, who used the name of Newell, on a jury in 1873. Court records were produced on which the name E. A. Newell appeared on the jury list. The Times opined "This fact may involved disagreeable consequences for somebody." Happily for Newell, he escaped serious legal problems; possibly because of his active involvement with Society for the Prevention of Crime. Founded in 1878, it helped bring down Tammany Hall. By the spring of 1891 Newell was its president; and was its secretary the following year. E. A. Newell left No. 859 before 1895. The store spaces were now shared by Clarke Co., manufacturing jewelers; and Amasa Lyon & Co., makers and dealers in umbrellas, walking sticks and parasols. The former political rooms were now used by Weinman & Co. for manufacturing ladies' and children's cloaks and suits. The products made and sold by Amasa Lyon & Co. were top of the line. King's Handbook of New York said "A 'Lyon' umbrella is indicative of taste, durability and reliability as to shape and color." Founded in 1877 by Amasa Lyon, it decorated its fashionable products with handles of gold, silver, ivory, horn and other costly materials. Like Edward Newell, Lyon had a problems with a dishonest employee. But unlike his predecessor, his was at home. On December 20, 1895 The Clothiers' and Haberdashers' Weekly entitled an article "A Dishonest Servant Arrested" and reported "Last Saturday Aurelia Delehanty, a servant employed by Amasa Lyon, of Amasa Lyon & Co., umbrella manufacturers, of 859 Broadway, New York, was arrested on a charge of stealing from her employer clothing and jewelry valued at several hundred dollars." Shortly after Aurelia was hired, the Lyons noticed "petty thefts." They reported them to police who staked out the house. "Detectives observe the servant's brother enter Mr. Lyon's house without a package and subsequently leave with a large bundle, which was discovered to contain many of the articles which had been stolen." Both siblings were imprisoned. An advertisement in the New-York Tribune on October 21, 1894 gave a hint at the scale of Clarke Co.'s operation. Announcing a sale of sorts, it promised "we are selling our enormous stock of the finest grades of Diamonds and other precious stones, mounted in the most unique and elegant designs, at prices much lower than elsewhere," it boasted. "You will also find our Colossal Stock of Gold and Silver Watches, find Gold Jewelry and Silver Novelties of the newest and choicest designs." 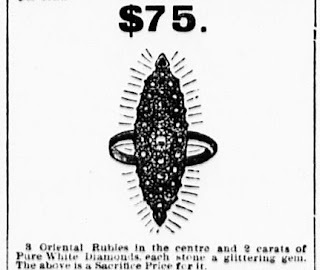 Other upscale jewelers may have been surprised with Clarke & Co. suddenly shut its doors in the winter of 1897. Auctioneer John H. French announced he would sell the contents of the store "commencing Monday, Jan. 18th, and continuing daily." The notice listed "fine Jewels mounted with diamonds and other precious stones, Gold and Silver Watches, Rich Jewelry, silver novelties, &c."
For a few years Errico Brothers, run by Joseph A. and Vincent A. Errico, had operated a high-class gallery almost directly across the street at No. 862 Broadway. The pair sold imported Italian statuary, carved furniture, glassware and the like. A few months after the Clarke auction they moved into No. 859 in 1897; but not before the Edwards estate hired architect James S. Maher to remodel the storefront for them. In December that year an advertisement in the New-York Tribune boasted that Errio Brothers "are now showing Italy's grandest productions in Marble Statuary, Glassware, Falance, Carved Furniture, etc...Lovers of art are invited to inspect our grand stock." Indicative of the artistic offerings of Errico Brothers was Fabio Fabbi's painting The Slave Market. Getting the artist's name wrong, The New York Times reported on November 3, 1900 "A painting by F. Fabbio of Florence, entitled 'The Slave Market,' has been and remains on exhibition at the gallery of Errico Brothers, 859 Broadway. The canvas is a large and interesting example of the modern florid Italian school, painted with much technical cleverness, fresh and cool in color, and well composed and drawn." After having been in business since 1859, Errico Brothers closed in 1907. They auctioned off their entire store March. The upper floor became home to J. M. Chanut & Cie, manufacturers and importers of expensive gloves. Silk or leather gloves were a mainstay in a lady's wardrobe--different gloves being necessary for different costumes or times of the day. There were gloves for walking, evening gloves, gloves for afternoon teas or rides, summer gloves, and so on. The Edwards estate updated the storefront again in May 1910. Architect L. Giller replaced the interior staircase at the same time. The total project cost would equal about $17,300 today. The property was described at the time by the Department of Buildings as a "brick and stone store and showrooms." While J. M. Chanut & Co. peddled its high-end gloves upstairs, the ground floor store--where once only wealthy gentlemen shopped for accessories--was a tobacco shop run by the Unique Cigar Co. The cigar store would remain in the space for years. J. M. Chanut & Co. faced a problem when war broke out in Europe. Its three factories were in France. So in 1917 it partnered with The Gloversville Silk Mills, in Gloversville, New York to manufacture its gloves. That firm opened its New York office in No. 859 as well. 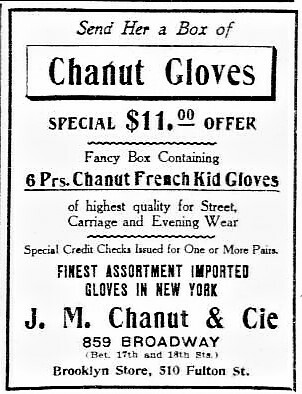 A Chanut & Co. advertisement in The Glovers Review in February 1919 boasted "In spite of the many complications incidental to manufacturing in France under war conditions, our sales for 1918 were the largest in our history." On the same page The Gloversville Silk Mills assured that its gloves were "produced from the choicest qualities of Japanese Silk. Finished in our own dye house with absolutely pure dyes." But the shops where well-heeled shoppers who purchased items like expensive silk and kid leather gloves were already abandoning Union Square. Many of the former stores became small manufacturing shops. Colt-Cromwell Co., Inc., makers of "leggings and overgaiters" moved into No. 859 by 1921. The 1960's and '70's saw the Union Square neighborhood greatly decline. The park itself became dangerous and overgrown as the city teetered on the edge of bankruptcy. Many of the old storefronts were shuttered and abandoned for years. Around 1997, as the neighborhood again turned around, No. 859 became home to Union Square Drugs. The pharmacy would be a fixture here for years. In 2004 the two upper floors were converted to apartments (one per floor). The Verizon store which occupies the storefront gives little hint of the building's more than 175 year history. But looking up, the passerby sees the windows from which Nancy S. Edwards once looked out onto Broadway and fashionable Union Square.